Escape the resorts and see the best of the surrounding area. I wanted to like Cancun. I really did. Mostly because I love moments where you’ve begun a trip with low expectations, embraced a place, and realized your relationship to that location has changed due to your experiences. To me, this is what travel is all about — not mindlessly listening to the opinions of others, but having the courage to keep an open mind and go and see for yourself. But there was something about Cancun in particular that brought the traveling Scrooge in me. Maybe it’s because I’m a Californian and the other side of Mexico is neighboring and familiar. Maybe it’s because I like to think the “spring breaker” portion of my life has passed. Whatever the excuse, Cancun simply wasn’t high on my travel wish list. 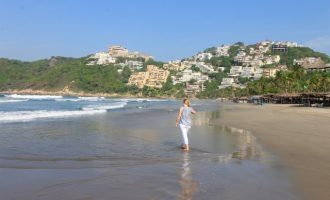 So when I booked a spontaneous flight there to attend a travel media conference (TBEX,) I had mixed emotions about what to expect. And while Cancun itself didn’t foster a change of heart, I did find it to be a great base for exploring a few places that did. 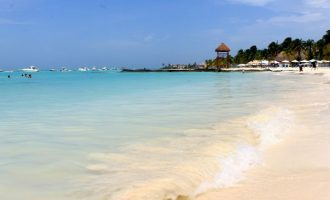 Traveling to Cancun does not have to mean umbrella drinks and compound-like, all-inclusive resorts. While I enjoy free-flowing cocktails, buffets, and lounging on the beach as much as the next person, these things alone do not pique my interest enough to warrant time away from my life at home. I needed to go deeper. 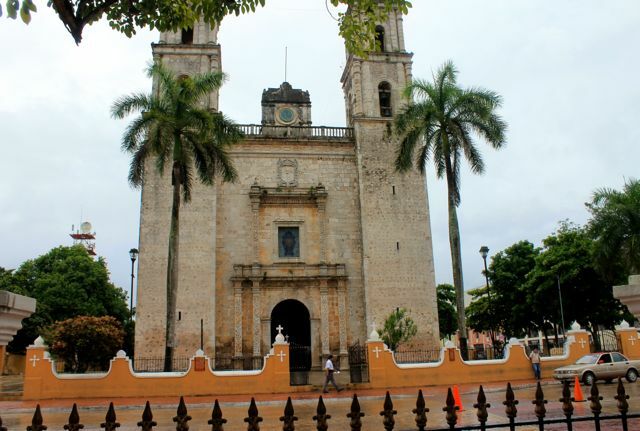 Many travelers head south to Riviera Maya, (more to come there) but I found heading west over into the Yucatan province to be a fascinating detour from the Cancun area. The best part about Valladolid to me was that I hadn’t heard of it before. 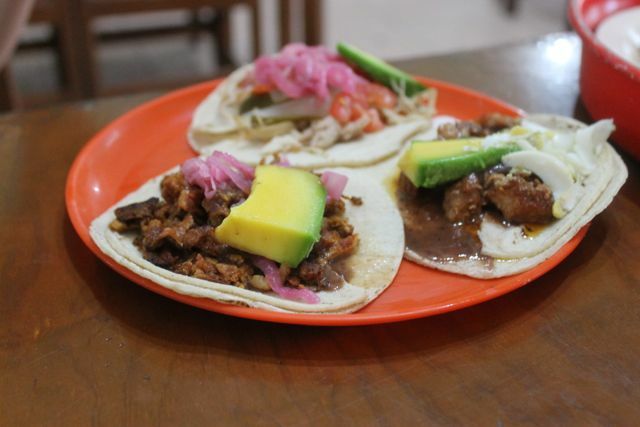 While it has become more popular as a stop on the road to Chichen Itza, it still feels like you’ve waltzed into the everyday lives of local people as opposed to something created for tourists. Though shops and restaurants clearly built as tourist infrastructure do exist, they’re easy to spot and avoid if you’re seeking something different. I enjoyed walking along cobbled streets, pausing to talk briefly with others or take in the town square and cathedral. The town feels more sleepy and traditional than catered to tourism, a welcome change. 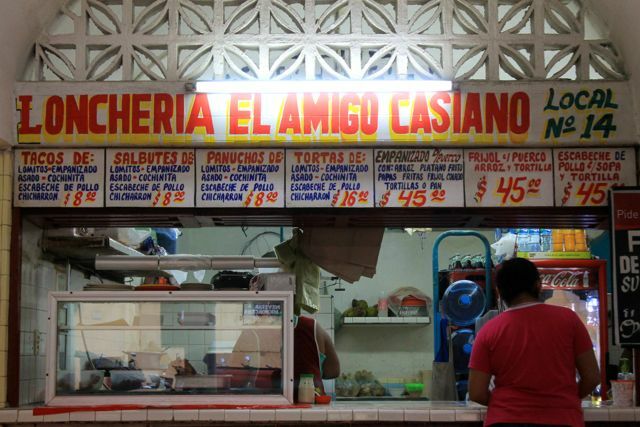 And you know this is the place to get some real Mexican food. My rule? First, look for locals. If you can’t see any eating where you’re looking, chances are your food will be more expensive and less tasty. Then — search for the restaurant where the people taking your order don’t seem to care whether or not you’re coming to eat with them. They don’t have to engage, promote, or speak to their food — it speaks for them. The quieter, more unassuming spots — that still have a steady flow of customers — churn out the best meals if you ask me. It’s easy to debate skipping Chichen Itza, especially if you’re short on time or you’ve explored other Mayan ruins. But then there’s the little fact that this massive monument is a UNESCO World Heritage Site and is considered one of the seven wonders of the New World. The ruins are massive and expansive, and for the most part well restored. If you have it in you to dodge the long roads lined with souvenir stands, this is a sight to behold. 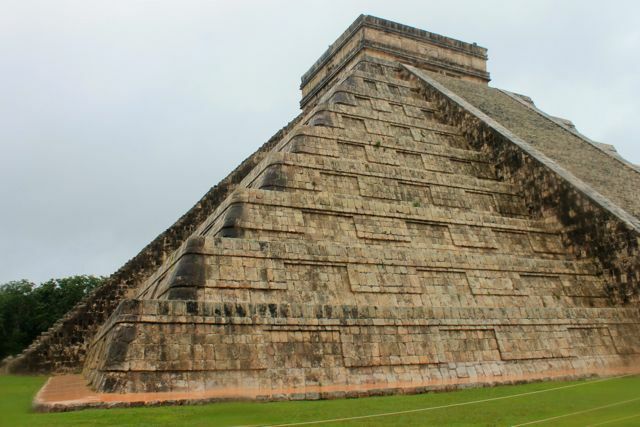 Seeing Chichen Itza is a travel dream for many of us, and it’s worth the drive from Cancun just to learn about the Maya history and stand in awe of the monuments. 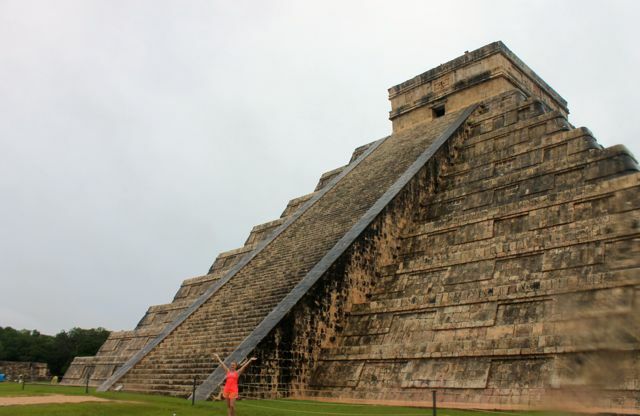 You can also book one of the many Chichen Itza tours from Cancun, if you don’t feel up to renting a car. Go early or stay late to avoid the busloads and tour groups. 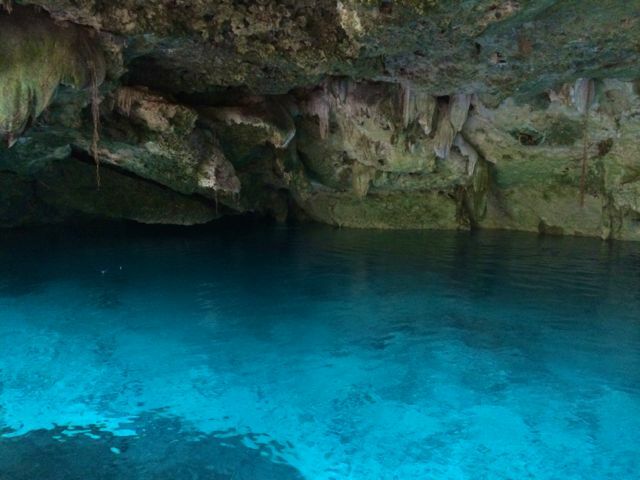 Magical is a term used perhaps too often in travel, but for cenotes, or natural freshwater pits present in great number throughout the Yucatan — it is a fitting description. 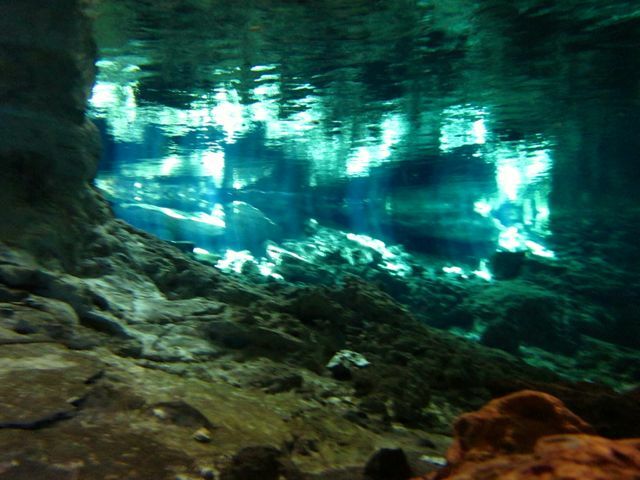 There is something otherworldly, spiritual, and all together beautiful about these pools of water. Swimming in one can be a refreshing break, scuba diving in one all at once calming and daring, and simply pausing to look at them is something unique and natural to the area. The changing color, light, and clarity is really something to see. You can reach all three of the side trips (town, monument, nature!) via a newer highway with higher speeds and tolls, or by slower, more interesting route along less maintained roads and through villages if you can take the time. We took one option either way, to see a little bit of everything in only a day’s time. 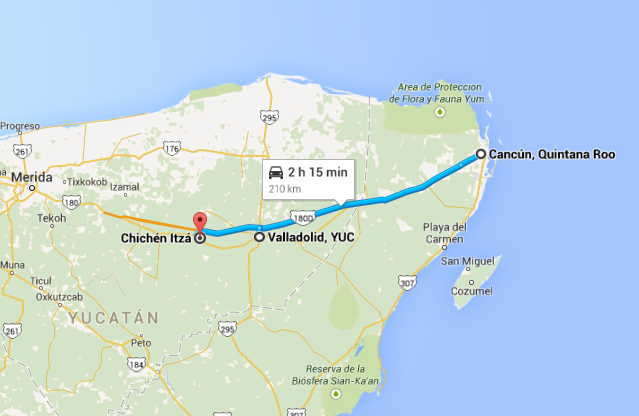 Easily both day trips from Cancun. 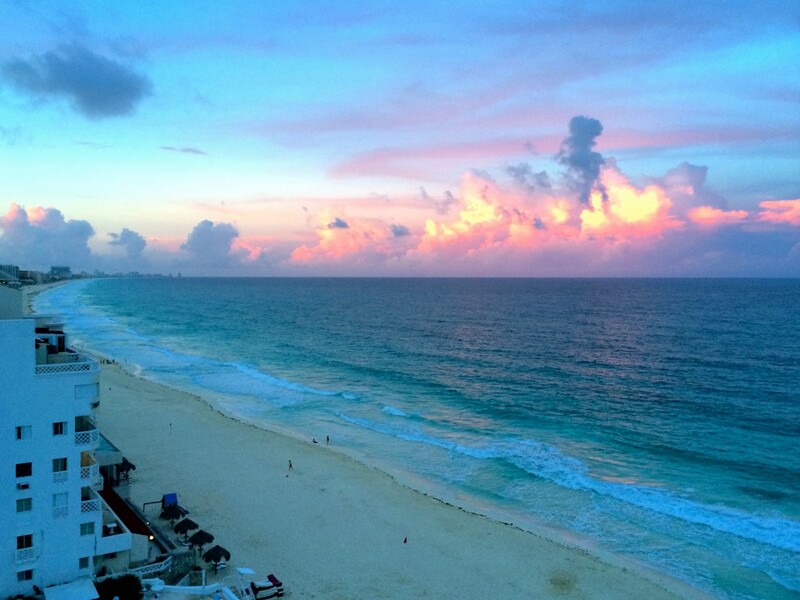 Even if you choose not to spend much time in Cancun, you can still enjoy it for what it is. Resort upon resort was built here for a reason: it is beautiful. It’s much easier to base yourself there, and it’s much more personal to rent someone’s condo or home as opposed to one of thousands of high rise hotel rooms. 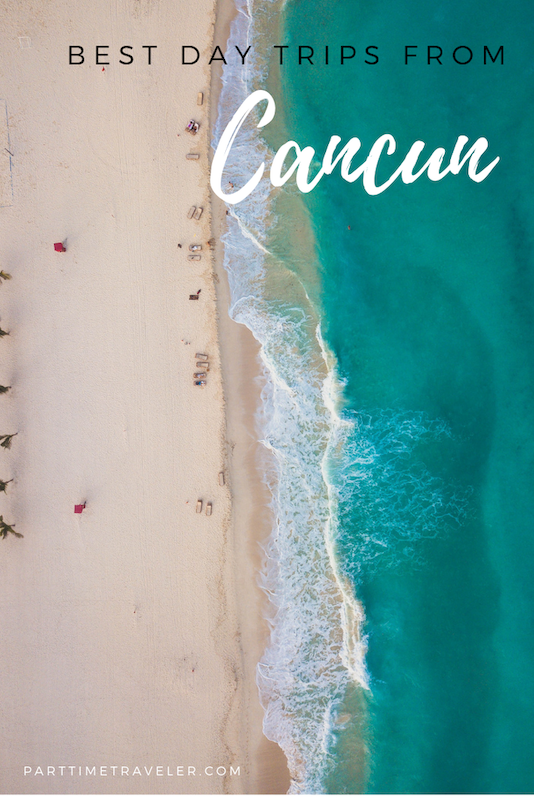 Find some calm in the chaos, don’t be afraid to explore outside of the hotel zone…and perhaps you’ll find yourself enjoying Cancun after all. View of the morning sunrise from the balcony of our condo rental (coffee in hand.) Perfect start to the day to explore Cancun and its surrounding area. Your posts are always so well crafted and beautifully written. It’s so clear that you were an English major! I’d love to return to this area and explore more (I was 8 years old last time!!). Ooooh fun! You will still love it. 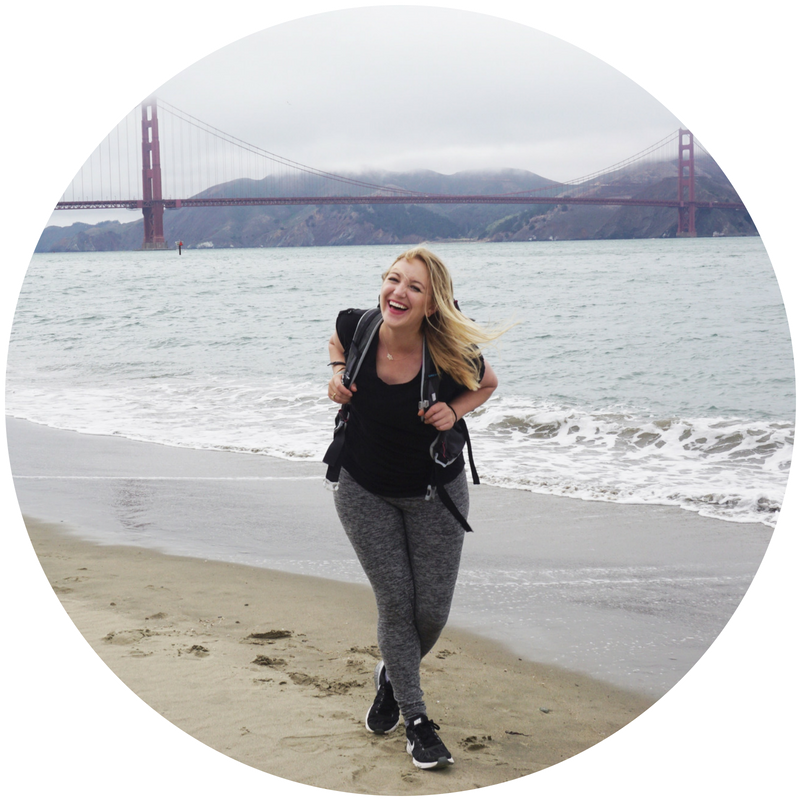 There is always more to be found for the traveler who seeks it 😀 I’d love to help answer any questions as your trip gets closer! I’ve never wanted to travel to Cancun because I’m not really a resort person. I’m glad you highlighted the areas surrounding the city because it made me realize the area is so much more than a resort. Oh good, Emiko! I’m so glad I could make you smile! There is so much more to see, and for me it was a good reminder not to write any place off. Exploration is the key! 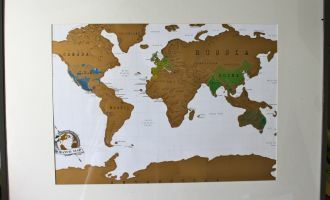 Great post, there is definitely a lot to do around Cancun, including the Yucatan and Quintana Roo. I’m heading back in January 2015 for the 4th time but I’ve never explored Cancun itself, do you think it’s worth it to spend any time there? Like others here, I’ve avoided it since I’m not a resort person. You are right on about Chichen Itza – it is tempting to skip it since it is so crowded and there are so many people trying to sell you souvenirs, but it’s still worth the visit. 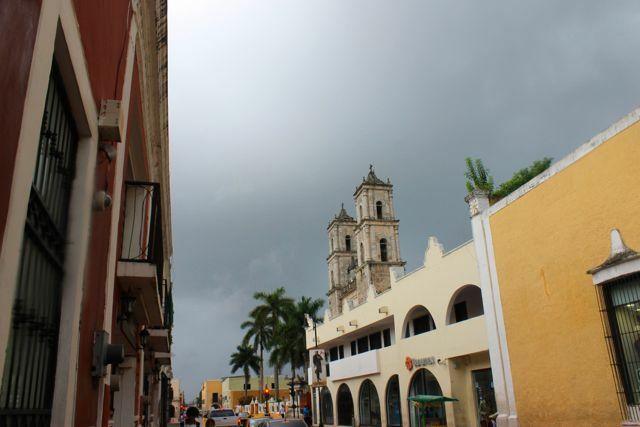 Another town that has a great beach and is less crowded than Cancun or Playa del Carmen is Puerto Morelos. Since it’s only 20 minutes from the airport it’s a great landing spot for a first night if continuing on somewhere else or last night if coming from somewhere and you have an early flight. 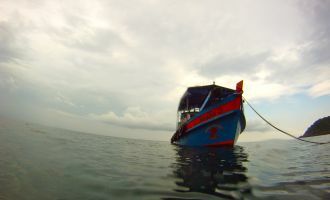 If you have more time and want to really get off the beaten path, Xcalak is amazing. These are some great additional tips – thank you so much for sharing! The city itself, at least within the hotel zone, seemed to be built exclusively for tourists. Parts of it reminded me of Vegas, which I’m also not a fan of. I still believe each place has its own experience waiting to be had…it’s just up to us to determine how much of it we want to embrace. For me, heading out of Cancun itself was best — though I hope to encourage people not to ignore the area entirely! I see I have some posts to catch up on! What you didn’t love Cancun? Lol I recall having to do shots at that mediocre taco place to make it through the evening. Vallodoloid, though was awesome!! What an amazing day and those tacos are making me hungry.